Wilmington police officer Patrick Black, center standing, is honored for his service to the Wilmington school district. Standing in the foreground from left are WPD Acting Police Chief Sgt. Ron Cravens, Black, and Wilmington City Schools Superintendent Mindy McCarty-Stewart. Seated from left are school board members Kevin Snarr (partly visible), and Marty Beaugard Sr.
At a Wilmington school board meeting from left are WHS Advanced Placement Chemistry students Kade Neu, Allie Kees, Nick McCabe, Olivia Veidt and Erica Preston. WILMINGTON — Sure, you could just simply drop change into the slot on a piggy bank. But it will be a lot more fun and educational to get a coin inside a piggy bank via a Rube Goldberg contraption that includes at least 10 steps in the process. When a Rube Goldberg Club started this month at Wilmington Middle School, 29 students signed up, Middle School Principal Bert Martini reported Monday night to the school board. Organizers were hoping to get enough youths to form a team and participate in the 2019 Rube Goldberg Machine Contest. Twenty-nine students, though, can fill out three teams, and each team will have its own piggy bank project. “We weren’t sure what the turnout or interest would be,” Martini admitted. But with 29 kids wanting to take part, and the machines they will imagine and create needing to have 10 steps, that would “leave some kids out on the outskirts,” said the principal. There will be an in-house contest among the three WMS teams, and the winner will go to the area competition. The activity started a couple weeks ago, and the club’s sixth-, seventh- and eighth-grade students are “so excited about this,” said Martini. The project holds appeal for educators, too. Among the things involved in inventing one of these “crazy contraptions” — terms used on the official Rube Goldberg website — are creativity, mechanics, student engagement and teamwork. Trained as an engineer, Rube Goldberg (1883-1970) was a newspaper cartoonist and an inventor. He “is best known for the zany contraptions of [cartoon character] Professor Butts. These inventions, also known as Rube Goldberg Machines, solved a simple task in the most overcomplicated, inefficient, and hilarious way possible,” states the website. The Rube Goldberg Machine Contest has received approval for listing by The National Association of Secondary School Principals 2018-2019 student contests, programs and activities. 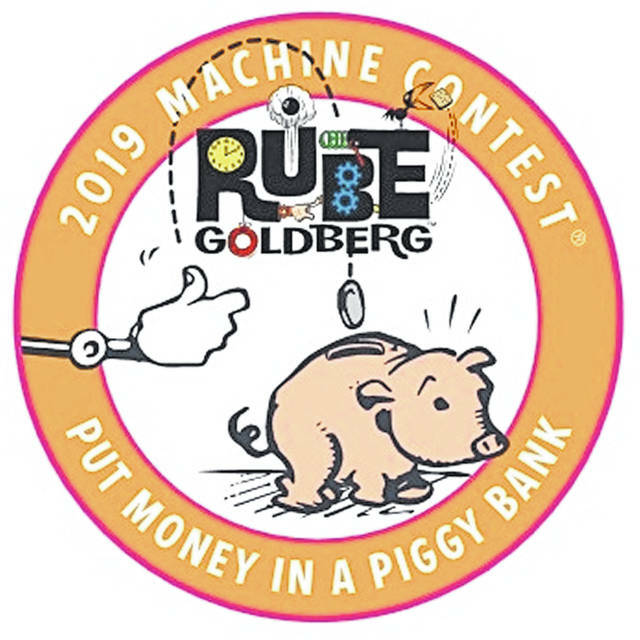 Since 1988, thousands of students have celebrated Rube Goldberg’s legacy by creating wacky but get-the-task-done machines in the annual Rube Goldberg Machine Contest. 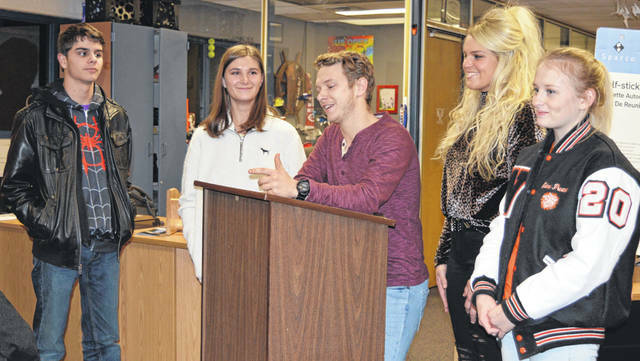 • Wilmington High School students taking Advanced Placement (AP) Chemistry spoke about their experiences as station guides for a COSI (Center Of Science and Industry) event recently held at East End Elementary School. WHS Principal Dr. Matthew C. Unger said he likes to see high school students involved at the elementary and middle school levels, with both high school students and the younger set benefiting from the interaction. The AP chemistry students who spoke at the board session are Kade Neu, Allie Kees, Nick McCabe, Olivia Veidt and Erica Preston. • East End Elementary Principal Jen Martin reported that students, in conjunction with Martin Luther King Jr. Day, chose a quotation from the civil rights leader and related it to school. • Two anonymous donations were accepted: $150 to Holmes Elementary School, and $600 to assist students who are economically disadvantaged on their lunch accounts. 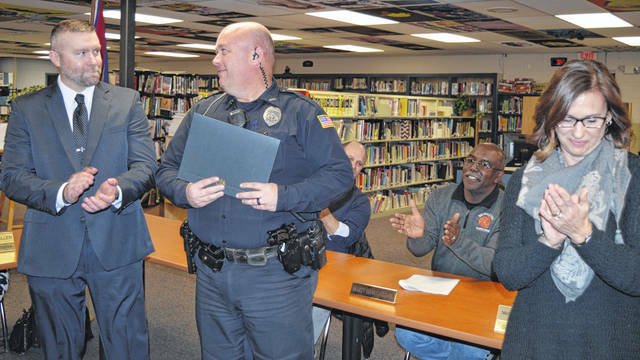 • Wilmington police officer Patrick Black was recognized for his service to the Wilmington City Schools district as school resource officer. He is being temporarily reassigned to patrol duty to help offset a WPD staffing shortage.